Call it The Old Hunk and the Sea. With All Is Lost, matinee idol for the ages Robert Redford sheds all vanity to play a man struggling to survive against long odds in J.C. Chandor’s first feature since he burst on the scene with 2011’s acclaimed talk fest Margin Call. The writer/director veers into a completely different direction with this thriller, a near-silent drama that offers Redford a solo spotlight. The actor answers with one of his finest performances in years. 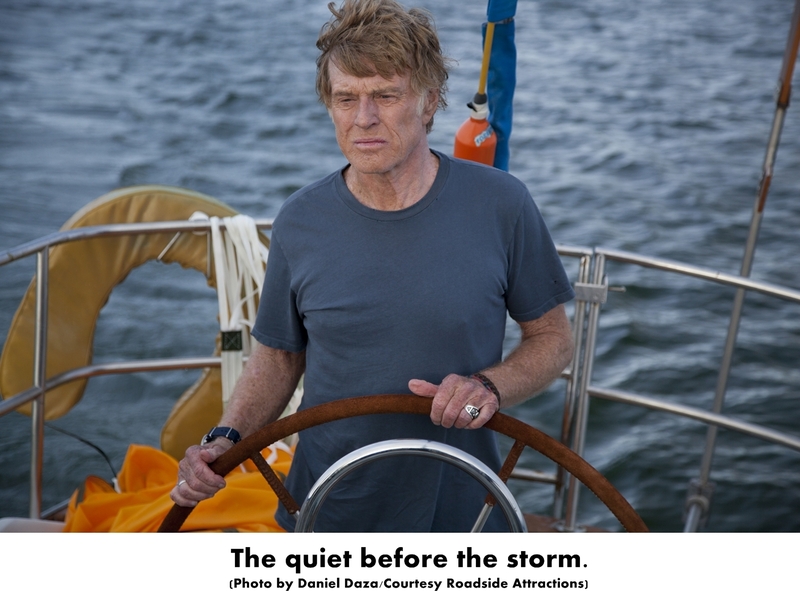 The credits refer to the 76-year-old Redford’s character as simply “Our Man.” Apparently a well-off retiree who heeded the siren song of the sea, he is sailing alone in the Indian Ocean when catastrophe hits and his boat is damaged. There is worse to come with bad weather and even worse luck. With electrical systems down, a busted radio and no GPS, Our Man’s best chance for survival is to set a course the old-fashioned way using the sun, moon, stars and nautical charts to find a shipping lane where a passing freighter might spot him. The pleasure cruise turns into a constant battle to stay afloat so that he might make it that far.